For some reason I am having trouble keeping up with the ABC & 123 picnic. I promised the girls I would get back on track this week--guess what? I'm late. So what do we do to have fun outside? We have always enjoyed activities outside. We really love Boccie Ball, it so fun and easy to play with every age. Baseball games were a big hit when my oldest was young. He was/is a huge baseball fan and loved to play the game. Our other children never really followed with this sport, but someone is always involved in a sport. We've done lots of soccer, flag football, lacrosse, and field hockey. There is usually some kind of net always set up in the back yard. Swimming is always fun too. We have a pool in the back yard which is getting quite a bit of use this week! 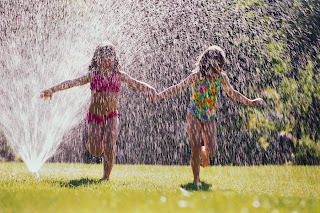 When the pool's not up there is always fun in the sprinkler and the slip-n-slide. A new favorite we have been enjoying is kickball. This is another fun game for ALL ages. Everyone kicks, everyone runs. We had a great time with this at a recent family gathering. Another activity we have been able to participate in lately is biking. We have always enjoyed biking, but we are able to do it more now that our area is getting lots more bike trails. Along with the biking goes hiking, always a favorite of ours--especially orienteering. Movement is so beneficial to all and just plain fun. you're pretty outdoorsy aren't you? I wish I was. we have just recently discovered boccie ball, it was fun!